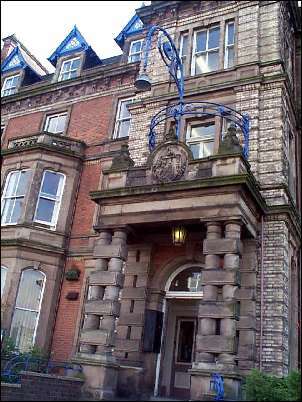 Hanley Town Hall - Albion Street. The original Town Hall was in Fountain Square - on the site now occupied by Lloyds Bank. 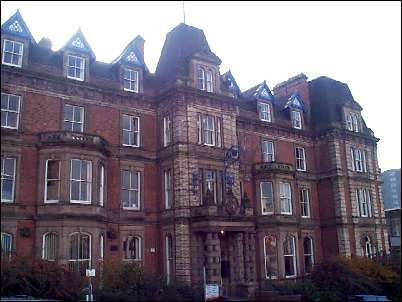 The present Town Hall in Albion Street was built as the Queens Hotel in 1869, designed by Robert Scrivener. It became the Town Hall in the 1880's. Job Ridgway's son John became the first Mayor. John Ridgway's crest of a kneeling dromedary was used in the Seal of the Borough of Hanley. To the left is the Albion Public House and to the right is Bethesda Methodist Chapel, the Potteries Museum and what was the offices of the Water Board. Directly opposite the town hall entrance door is the War Memorial. Detail above the town hall door. 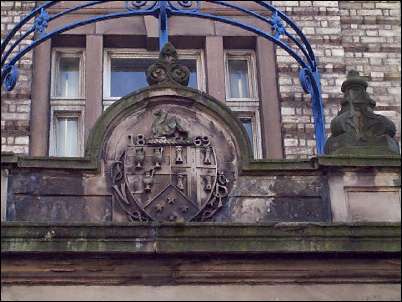 John Ridgway's crest of a kneeling dromedary was used in the Seal of the Borough of Hanley, and now forms part of the Coat of Arms of The City of Stoke-on- Trent. If you want to print this page out then set the print to landscape.